Are you ready for another day of My Creative Time sneak peeks? Today we are showcasing a sweet little set called Inside Christmas Cards, which is our freebie this month! This set will be free to the first 100 shoppers this Friday beginning at 8 AM PST. Inside Christmas Cards has three sentiments that are perfect for using on the inside of your cards, or, as you can see with this one, which I heat embossed with platinum embossing powder, on the outside! Since this sentiment is something Santa would obviously say, I thought it would be fun to combine it with the Santa hat from yesterday's Santa Suit Dies, having it just peeking it out of a chimney, so that it looks like Santa is on his way down to give out his presents. I got the chimney cut from the Cricut Simply Charmed cartridge. The background sky paper is from an older Echo Park collection in my stash called Winter Cheer, and I trimmed it and the red layer with the Stitched Rectangular Frame Dies & More and the MORE Stitched Rectangular Dies. Some Pretty Pink Posh Sparkling Clear Sequins finished off this card! OMG Miss Katie....Your card is Ho HO HO HO-Larious!!! I love it!! Talk about being super clever and oh so creative....and Oh Yes the perfect sentiment inside!! You so did a Super Outstanding Creative job!! Oh how cute and fun is this card! Super cute Christmas card Katie! 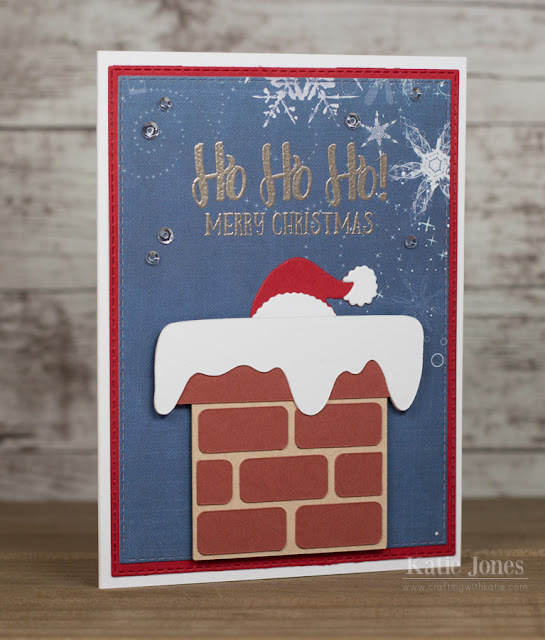 The embossed sentiment is fabulous and love the cute Santa hat! Such a fun release! Super cute card! I love how you have the santa hat peaking out of the chimney! Very creative! Cricut to the rescue...so many great cuts. Very clever idea and the sentiment and flakes look great on the background. Wonderful job. Such a creative card! Love it! Fun card, I love those colors! Great use of Santa's hat. Awesome sentiment for your adorable card! Your card is so cute! Love this new set of sentiments. Your card is super fun and adorable! Love your card!